After a hot day it is now thundering and raining. We went to the bike shop this morning, laden with our own seats, pedals, bike locks and front pannier racks, ready to collect our hired bikes. We adjourned to Staromestske Nameste – Old Town Square – while Davide was setting them up and watched a 5 piece jazz band and throngs of tourists. On returning to the bikes it transpired that, despite our specific request, provision of all relevant information and assurance that there would be no problem with fitting the racks, they actually don’t fit. This reduces our luggage carrying capacity to 2 rear panniers only. This is not a disaster, but we will need to rationalise our stuff and leave a bag behind at the hotel. The bikes appear to be OK apart from that. We tested them out with a ride downstream beside the Vltava, then back for a siesta and escape from the heat. I only got yelled at once by a Czech motorist. Our evening activity was an aperitif in Josefov, the Jewish quarter (chilli parecky – sausages with horseradish and mustard – delicious) followed by a concert in the Spanish Synagogue. 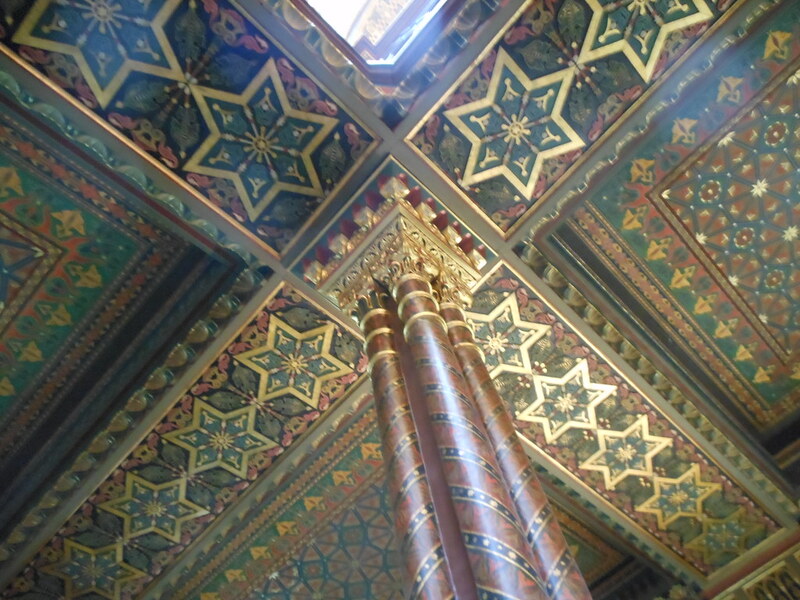 The interior of the synagogue is lavishly decorated in the Moorish style. It was the perfect setting for a memorable performance entitled Jewish Mystical Melodies by violinist Alexander Shonert, accompanied by pianist Natalia Shonert. Alexander played a variety of Jewish and Klezmer pieces with some Vivaldi and Gershwin as well. He seemed to enter into an ecstatic state as he played, head back, smiling, open mouthed, eyes closed, playing with absolute intensity. His playing was extremely virtuosic as were his flourishes at the end of each piece. As the concert progressed so did the thunder storm outside and he just came short of spontaneous combustion as the program ended. We came out to find rain falling steadily and had a damp ride back across the river and up the hill. This entry was posted on 5 July 2012 at 8:03 pm and is filed under Czech Republic. You can follow any responses to this entry through the RSS 2.0 feed. You can leave a response, or trackback from your own site. just one pannier bag each?! where will you pack the hair dryer, cappuccino machine and make up case? Actually 2 pannier bags each, where we had planned for 4 each, 2 large and 2 small. The small ones won’t be coming with us. No hair care products will be packed except for hair curlers, hair straighteners, hair gel, hair spray and hair clips, and that’s all.